of providing quality healthcare facilities and services to masses. After inaugurating the Refurbished National Institute of Health (NIH) here, he said though after the 18th amendment, the subject of health had gone to provinces, the federal government was still responsible for cohesive coordination for the provision of quality health services to masses. He said during the last five years under the leadership of Muhammad Nawaz Sharif, the PML-N government had delivered a lot by setting up quality healthcare facilities across the country. If these policies continue to be pursued, the country would definitely meet its international obligations of providing quality healthcare to masses under the Sustainable Development Goals (SDGs) 2030, he added. 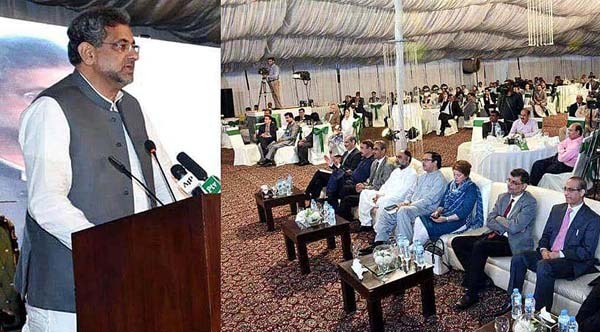 Shahid Khaqan Abbasi also referred to the Prime Minister’s Healthcare Programme and hoped that this program would help provide 100% health coverage to poorest of the poor across the country. He said the government considered the heart ailments as a serious health issue and had provided Rs. 10 billion for stents, and if required the government would provide additional funds for this program. The Prime Minister said opening of a state-of-the-art disease control center, establishment of a database as well as the production of different vaccines at NIH will help check infectious diseases from the country. He said the government was close to eradicating polio from the country with the help of Malinda and Gates Foundation and was now targeting Tuberculosis. The Prime Minister appreciated the Ministry of National Health Services as well as NIH for their efforts towards the provision of quality healthcare to masses. Earlier, Prime Minister Abbasi performed the inauguration of the Refurbished NIH and took round the various departments of the institute. Minister for National Health Services Saira Afzal Tarar in her remarks, on the occasion, said during the last five years the PML-N government pursued the policy of providing quality healthcare to masses as one of its top agendas and worked hard to meet its national and international commitments. the SDGs, adding, the Refurbished NIH was very different – in terms of health services – from that which they inherited in 2013. “We will be going back to the people (in general election) and seek their support on the basis of our performance,” the Minister remarked. She thanked the Prime Minister for allocating more funds for NIH. The Minister also thanked the international donors and partners including the World Health Organization (WHO) and others for their support in the health sector. Secretary National Health Services Naveed Kamran Baloch and Executive Director NIH Brig ® Amir Ikram also spoke on the occasion and highlighted various health related services being provided by the refurbished NIH.